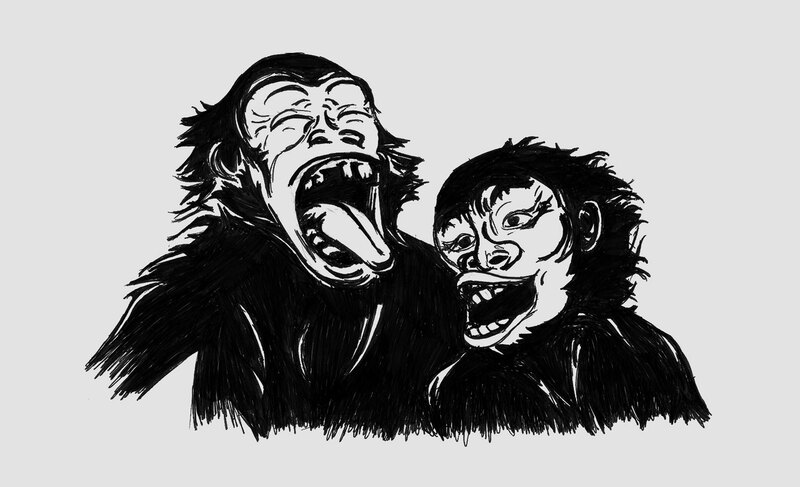 Lots of animals laugh, like monkeys and dogs: monkeys with a panting sound when they are tickling each other and doing other monkey things, dogs with a playful bark-pant. Monkeys and dogs are just so cute when they are having fun, but if a monkey or a dog lacks the ability to laugh the result is not so cute – they do not fare well in their monkey and dog worlds. Laughing is a signal that it is a playful and friendly interaction. Without the ability to laugh, our poor monkey or dog’s actions are taken to be aggressive. This is similar to that time when you sent that supposed-to-be funny text to your girlfriend who could not hear your playful giggles. She was so mad. And you were a monkey in the dog house. The laughter proto-language develops in tiny little baby humans long before words do. Scientists think laughter in early humans served the same purpose as it does today in other laughing mammals. It communicated that there were no imminent threats and survival needs were taken care of. It was time to play, learn and explore – cognitively, emotionally and socially. It contagiously put those around at ease and recruited others to join in. It is exactly the situation in government meetings that there are no imminent threats, survival needs are met and it is time to explore and learn. It is exactly the goal of a meeting to recruit others to engage in social interaction. Yet politics is a barren laughter-desert. When it does happen, it is divisive, at someone’s expense. Humour can radically change the course of a meeting. It dissolves emotional barriers in a way that logic or yelling often cannot. We do very well at electing politicians who wear proper suits and have proper hair cuts, but we should also be selecting for sense of humour. It might be wise to elect an entire party whose stated agenda is to use the power of humour to improve decision making. If we didn’t already have enough reasons for electoral reform, this is another one.